It is Lion-only. It won’t run on Snow Leopard. It can now be unlocked through In-App purchase to have all the features of the regular Cashculator version. This means unlimited planning into the future and unlimited number of “what-if” scenarios. Cashculator is now working inside the sandbox, which is an important new security feature in Lion. This brings increased protection from possible hackers if they break Cashculator to do their bidding. For example, Cashculator now won’t be able to access files on your file system, except the files it needs for work or your CSV exports. Important: Because Cashculator works in the sandbox now, it also means that the database is moved to the application’s container, which is a special folder in the user’s Library folder (which is by default hidden in Lion). In non-sandbox Cashculator, the database was at [user home]/Library/Application Support/cashculator/ folder, and now it is in [user home]/Library/Containers/com.apparentsoft.cashculatorfree/Data/Library/Application Support/cashculator/. Yes, much deeper in the folder hierarchy. One of the features that was hit by sandboxing was the ability to have Cashculator’s database in any location in the file system and not only inside the Application Support. This is now not possible (remember the container?) so if you had your database in a custom folder, you should copy it inside the container folder above. If you didn’t move your database manually, you don’t need to do anything. All files will be moved inside the container automatically. To celebrate this event we temporarily set the price of the in-app purchase at 33% discount of the regular price. 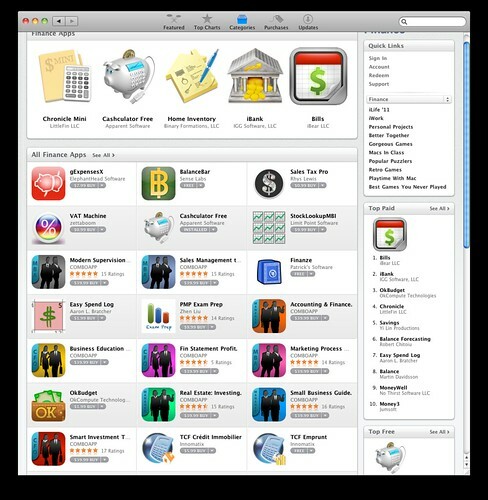 Note, only the Free edition of Cashculator requires OS X Lion. The regular version of Cashculator on the Mac App Store works on 10.6 (Snow Leopard) and the version available directly on our site is a Universal binary running on PPC or Intel on Mac OS X 10.5 (Leopard). A couple of days ago we finally released Cashculator Free on the Mac App Store. It’s a little limited version of our Cashculator application, which is available for about 18 months now. The Free version is only limited in the number of scenarios (up to 2) and the number of months that you can plan your finances forward (3 months). Otherwise they are the same. Free seems to have its power in getting a word about your application as it removes any barriers to downloading it. 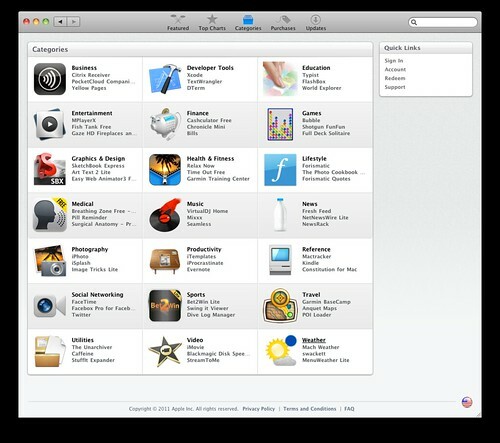 So far we’ve got some prominent positions on the Mac App Store, at least in the Financial category. It’s number 1 Free Financial app in many countries (including major ones) and it’s also inside top 50 Free Apps currently in the US, UK, Japan, Canada, Australia and more countries. It’s an interesting experiment in marketing for us and we’ll see if it will convert to more sales of the full version. Even if not, it’s still good for our new customers and for us. FIX: Scroll to current month when launching. Fix disappearing of edit for new scenarios names. Fix link to Cashculator forum. NEW: Complete sidebar entry when enter is pressed in comment field. Wider border between rows in “Both” view. Added note in guide about multiple accounts at step 38. Updated English manual with hints on handling multiple accounts. Subscribe to Cashculator newsletter menu item added. Auto-update from Cashculator menu or download from http://www.apparentsoft.com/cashculator/download. NEW: Added “Send feedback” dialog to Cashculator menu. Now you can report feature suggestions and bugs without leaving Cashculator. NEW: Toolbar now saves its configuration between launches. NEW: Added a “Cancel” button to password enable/disable dialog. Download Cashculator from http://www.apparentsoft.com/cashculator/download or auto-update. NEW: Hide applications’ .app extension unless overridden in Finder preferences. CHANGED: Trial notice dialog now has a button to enter licensing dialog to enter license information. Some more changes to help with common support issues. Download Blast from http://www.apparentsoft.com/blast/download or auto-update. Everyone is encouraged to update, although not all will see the immediate benefits.